During today’s sessions of the annual conference of USPG, Rachel Parry told the harrowing story of Bishop Carlo Morales who is being detained illegally in the Philippines for almost two months now. 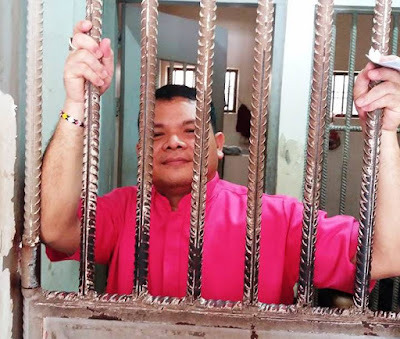 Bishop Carlo Morales is the Bishop of Ozamis in the Iglesia Filipina Independiente (IFI), also known as the Aglipayan Church and the Philippine Independent Church, and is in communion with the Anglican Communion. The conference of USPG (United Society Partners in the Gospel) is taking place at the High Leigh Conference Centre near Hoddesdon in rural Hertfordshire. On 11 May, he was illegally arrested and detained and now faces fabricated charges. Bishop Carlo is a peace advocate and a member of Pilgrims for Peace, the Philippine Peace Platforms and the Ecumenical Bishops’ Forum, which have been steadfast in their demands for the Philippine government and the NDFP (National Democratic Front of the Philippines) to resume peace talks that began in 1994. Support for the peace talks is part of the Church’s prophetic peace-building ministry. Bishop Carlo was travelling with his wife, Maria Teofilina, and their driver, Isadome Dalid, to Ozamiz, on 11 May 2017, when they were flagged down by Rommel Salinas, a consultant for the NDFP, who asked for a lift. As a consultant involved in the peace process, Salinas carries a card that guarantees legal safety, including unhindered passage and immunity from search, arrest and detention. However, as the bishop’s car approached Gango in Ozamiz City, they were stopped at a military checkpoint. Salinas was arrested, despite the guarantees of immunity. Bishop Carlo, his wife and the driver were told they were free to go, but Bishop Carlo decided to stay with Salinas. When they arrived at a police station, all three were handcuffed and told they were accomplices to a high-value target and that they were harbouring a criminal. Their bags were confiscated, and the police claimed they had found a weapon in one bag. The police refused to allow the bishop to have a private conversation with his lawyer, and he was told that he was going to be charged with the illegal possession of explosives that had been found in his car. Since then, the legal process has been delayed and prolonged. The IFI has been subject to political persecution and threats ever since it was founded in 1902. Its origins are similar to the Old Catholic churches in Europe and the Reformed Episcopal Churches in Spain and Portugal. The Obispo Maximo (Archbishop or Primate) of the IFI, Alberto Ramento, was brutally killed on 3 October 2006. The church believes he was murdered in order to silence him for his life-long stand for justice in the Philippines. His killers have never been charged or tried. But today, the IFI has 6 to 8 million members and is the second largest church in the Philippines. Canon Grace Kaiso, General Secretary if the Council of Anglican Churches in Africa, spoke at the conference this evening of his work with the 40 million Anglicans in Africa, and the variety of this work. He spoke of how some Anglican provinces in Africa cover only one country, while others cover several countries, including the Provinces in West Africa, Central Africa and Southern Africa. He asked us to consider whether there are ways in which our partnerships with communities may have contributed to unsustaintable livelihoods, and asked how the ‘midwife’ approach can be of mutual benefit to USPG and its partners. After the Morning Eucharist celebrated by Canon Joabe Cavalcanti, a USPG trustee, the conference continues tomorrow with Bibles studies, workshops and a meeting of the council of USPG. USPG (United Society Partners in the Gospel) is one of the oldest Anglican mission agencies, founded in 1701, but this afternoon we heard of exciting new initiatives working with the church to meet the challenges presented in the 21st century. Welcoming us to the conference, the Revd Chris Chivers, chair of trustees, spoke of reconnecting with the ‘DNA’ of USPG. In our first session this afternoon, Janette O’Neill, USPG General Secretary, invited us to look at USPG’s work with the Church and Communities through the experiences of USPG staff members. She explained how this is worked out through the way USPG promotes collaborative and mutually accountable leadership, takes part in dynamic alliances, and pursues justice through locally defined and sustainable initiatives. Enthusiastic staff members who shared their experiences in the past year included Rebecca Woollgarr, Volunteering Manager; Emma Bridger, Programme Monitoring and Evaluation Manager; Rachel Parry, Director of Global Relations; Rebecca Boardman, Programme Co-ordinator, Advocacy and Mission, Global Relations; Naomi Herbert, Director of International Programmes; Edgard Ruddock, general adviser, Global Relations; Habib Nader, Programme Manager, Global Relations; Richard Bartlett, Director for Mission Engagement; Evie Vernon, Programme Adviser, Theological Education; Fran Mate, Programme Manager, International Programmes; and Davidson Solani, Programme Manager, International Programmes. They were filled with infectious commitment as they spoke of USPG’s work in Greece, the Philippines, Brazil, Pakistan, South Africa, South Korea, Ghana, Zambia, Zimbabwe, Malawi, the Anglican churches in the Indian Ocean, and in areas including climate justice, refugees, people trafficking, gender justice and health education. Rebecca spoke of Father Malcolm Bradshaw and the work of Saint Paul’s Anglican Church in Athens with refugees in Greece, in partnership with the other churches in Greece. Richard Bartlett also spoke of the work with refugees and migrants in Greece. He spoke too of USPG’s presence at Greenbelt and USPG’s fringe event at the General Synod of the Church of England in York, and discussed USPG’s work at theological college and with ordinands, including the ‘Re-thinking Mission’ conference. Emphasising the value of ‘people meeting people,’ Rachel spoke of mutual dependence and responsibility in the Body of Christ. Habib spoke of how USPG is changing mindsets, making a difference and unlocking potentials. But it is hard to get it all into an hour, and the annual report tells a more detailed story and provides a fuller picture. The speakers and attendance at the conference includes people from dioceses in the Church of England, the Church of Ireland, the Scottish Episcopal Church, the Diocese of Europe, the Church in Wales, South Africa, Bangladesh, the Philippines, the West Indies and Myanmar (Burma). Throughout the conference, our worship is being led by Father Herbert F Fadriquela Jr, chaplain to the Filipino Community in the Diocese of Leicester. I am in England for these three days, attending the annual conference of the Anglican mission agency USPG (United Society Partners in the Gospel). This year’s conference theme is ‘Serving the Churches, Strengthening Communities.’ The conference is looking at how USPG is working in partnership with Anglican Churches around the world to help serve local churches and strengthen communities. In particular, the conference is focusing on five key thematic areas of the work of USPG: protecting health, growing the Church, enabling livelihoods, promoting justice and responding to crises. The conference opens today (Monday 17 July 2017) with registration from 3 p.m. There will be talks, workshops, ideas to take back to parishes, and opportunities to meet some of USPG’s world church partners. The invited speakers include Jo Musker-Sherwood of Hope for the Future, who is discussing how the Church can engage with the issue of climate justice. Hope for the Future was established in 2012 to equip faith communities, local groups and individuals across the UK to raise awareness of climate change. The patron is Bishop Steven Croft of Oxford. The Revd Canon Grace Kaiso, General Secretary of the Council of Anglican Provinces of Africa (CAPA), is looking at how the Church is working with communities to enable livelihoods. The Revd Dr Carlton Turner, of the Church in the Province of the West Indies (CPWI), is exploring how we might grow the Church. The Right Revd John Wilme, Bishop of Tongoo in Myanmar (Burma), is speaking about protecting health. As a trustee of USPG, I have been invited to chair part of the conference on Wednesday morning, when the Right Revd David Hamid, Suffragan Bishop in the Diocese in Europe, is speaking on how the Church is responding to crises. In the current edition [Summer 2017] of Transmission, the USPG magazine, two former police officers, Diana and Roger Boyles from Nantwich, describe how they recently spent 10 weeks in Greece with USPG’s ‘Journey With Us’ placement programme. This is an moving response to the current refugee crisis in Greece and illustrates the response of the Anglican church in Athens. ‘We discovered USPG at the Greenbelt arts festival last year. We found ourselves listening to a talk by Fr Malcolm Bradshaw, formerly senior chaplain at St Paul’s Church in Athens. ‘Fr Malcolm explained how 60,000 refugees had arrived in Greece, having fled war and other dangers, only to find themselves living in appalling conditions. Additionally, we learned that the Greek financial crisis of 2007 had left thousands of Greeks in near-poverty. ‘Also at Greenbelt, we heard about USPG’s Journey With Us programme. We made enquiries, and eventually found ourselves on a ten-week placement at St Paul’s. ‘We spent a lot of time at a Salvation Army day centre where we met families from Syria, Afghanistan, Iran, Iraq and Eritrea, as well as local Greek families in need. Without exception, everyone had a traumatic story to tell. Many had been separated from family members, some of whom were still facing dangers in their countries of origin. ‘We also spent a week on the island of Lesbos with the Lighthouse Relief refugee project. Lesbos is very close to Turkey and one of the islands where large numbers of refugees landed having crossed the Aegean Sea. Lighthouse has been welcoming and supporting refugees as they arrive. ‘The St Paul’s congregation certainly has a heart for mission. For example, the church is supporting the ‘Church in the Streets’ programme, which offers two hot meals a day to whoever comes and queues – a service that has been running since the financial crash without missing a single day. ‘Most of the refugees didn’t plan to live in Greece but, due to closed borders and a complicated asylum process, they have little opportunity to go elsewhere. Many are in camps that provide inadequate accommodation because they were only conceived as a short-term solution. The Greek refugee situation might not be making the headlines at the moment, but clearly the crisis is not over. ‘God is at work among those of all faiths who are trying to make the situation better, but there is an opportunity for so much more. This year’s conference is taking place in the High Leigh Conference Centre, near Hoddesdon in Hertfordshire. Last year’ , the conference took place in the Hayes Conference Centre in Swanwick, Derbyshire, but USPG is returning to High Leigh for this year’s conference. The conference closes on Wednesday (19 July 2017). Residential places at the conference are now booked out, but visitors are still welcome to the Day Conference tomorrow (Tuesday 18 July 2017). I am catching the first flight from Dublin to Stansted this morning, and I hope to spend an hour or two in Cambridge this morning before a meeting of trustees, or on Wednesday afternoon when the conference ends, browsing in the bookshops. Perhaps there may even be time during a break in the conference for a walk in the countryside in Hertfordshire and Essex before catching a late flight to Dublin on Wednesday in time for a late-night bus to Limerick.